Dr. Beddow’s instrumentation class has been building the 2016 version of the Cave Pearl datalogger for more than three years, and feedback from that experience motivated a redesign to accommodate a wider range of student projects while staying within the time constraints of a typical lab-time schedule. The rugged PVC housing from the older build has been replaced with an inexpensive pre-made box more suitable for “light duty” classroom deployment. The tutorial includes a full set of youTube videos to explain the assembly. We hope this simplified build supports other STEM educators who want to add Arduino-based experiments to their own portfolio of activities that develop programming and “maker” skills. Via the comments. 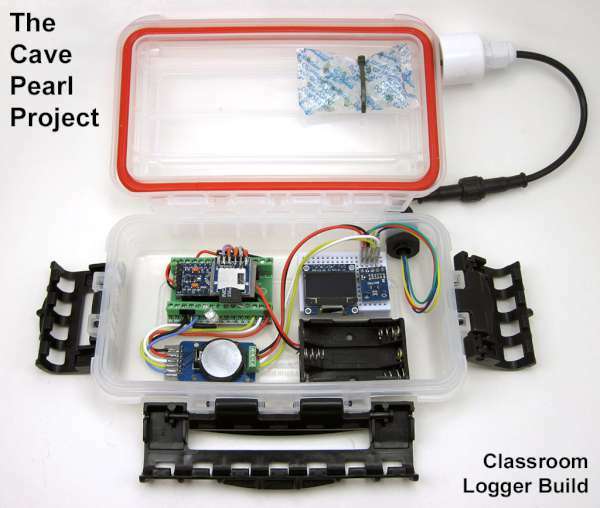 More details on Underwater Arduino Data Loggers blog.